Forums usually provide a place where different subjects can be discussed by the members of the board. Since the Boonex Dolphin platform is indeed for managing large amount of user accounts one of the best functionalities it has integrated is the combination of social network plus forum feature. In this tutorial we will show you how to easy and quick setup a forum for the users of your Social Community. Since the forum functionality is provided by a module you will need to know how to install a module which we have explained in one of our other Boonex Dolphin tutorials. We will begin with the activation of the Forum module. For this purpose you will need to login into the administration area of your website and to navigate to Modules>Add & Manage. There under the NOT INSTALLED MODULES section you will find the Forum module if of course you have not already activated it. 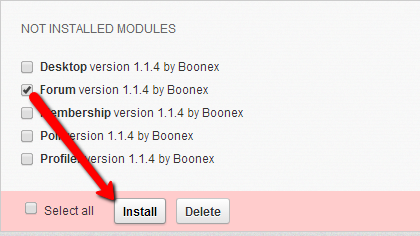 In order to install the module please check the checkbox in front of the module and use the Install button. Once the module has been installed you will be presented with a message indicating that the installation has been successful. 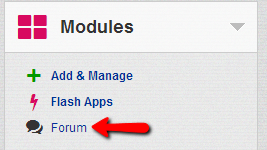 Now that you have the module activated you are probably wondering how to access the forum. 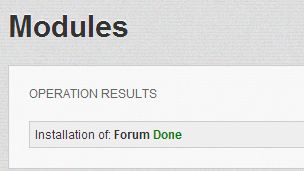 Well since this is a newly installed module it will be available under your Administration area>Modules>Forum. This link will redirect you to the frontend of your Social Community where the forum will be already available in the top horizontal navigation menu and you will be able to add Topics to the forum. Congratulations! You are now able to install and use the Forum feature of your Dolphin social community!